Members of the Knights of Leather. The Knights Tournament run is modeled on medieval tournaments, a weekend of games, rituals, camaraderie, a formal banquet—and rustic, rough-hewn, candle-lit dungeons in the woods. This year’s run was held the weekend of May 31-June 2 and was sold out, with more than 100 people in attendance. Those 100 people included representatives of 10 clubs, organizations, and groups. In addition to Minnesota, attendees came from North Dakota, Iowa, Illinois and Texas. Many members of another Twin Cities club, the Atons of Minneapolis, attended this year’s Tournament as a show of support and solidarity with the Knights. The Atons, who last year celebrated their 40th anniversary, played a part years ago in helping the Knights of Leather form as a club. Founded in 1985 in the Twin Cities as a club exclusively for leatherwomen, the Knights were reconstituted in 2000 as a pansexual leather club. Although there were clubs for leatherwomen on both coasts, The Knights of Leather was the first club for leatherwomen in the Midwest. In attendance at Tournament 25 was PJ Knight, the club’s first pledge (or “squire”) and now the most senior member of the club. On Friday evening Knight hosted “Tournament 101,” an orientation session and tour of the grounds for those who had never before attended Tournament. Later on Friday evening, the traditional ceremony of remembrance was held around the campfire. On Saturday afternoon PJ Knight and your humble columnist were two members of a five-member panel sharing their memories concerning local and national leather history. 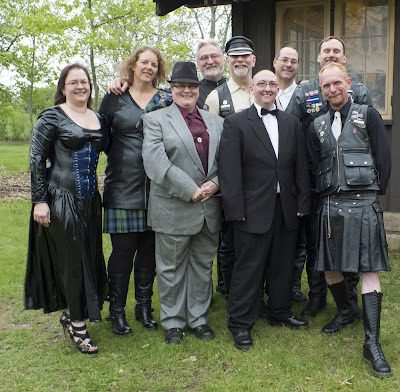 In addition, available all weekend in the main lodge were notebooks, photo albums, and scrapbooks documenting the history of both the Knights of Leather and Minnesota’s GLBT and leather communities. In keeping with the weekend’s “Silver” theme, both decor and guest attire for Saturday evening’s formal banquet were filled with glittery, shiny, silvery, sparkly things. The pre-banquet cocktail hour was hosted by The Atons of Minneapolis. So what comes after 25? Next year the Knights will present Tournament 26, the theme of which was announced during the Tournament 25 weekend as “Alphabet Soup: Kink from A to Z.” For more information about Tournament 26 and the Knights of Leather, visit <http://www.knightsofleather.com>.